Two of the sweetest and tender words in the Bible are “and Peter.” What’s so loving about those words? It is actually a special message. It is a special message meant to comfort Peter. In typical Peter fashion, he had been the first to defend his loyalty and the first to discard it. He boasted the loudest (I would die first!) and fell the hardest (3 times?). If Peter was anything, he was consistent, wasn’t he? The man always did it big. He won big (walking on water!) and He lost big (really, 3 times, man?!). So, of all the Apostles, Peter was probably the most ashamed of abandoning Christ at the last moments. He didn’t just run away – he cursed Jesus’s name! Jesus knew this about His servant. Jesus knew Peter was probably beating himself up something terrible. So, He had the angel give a extra message to Peter. I’m sure this message brought tears of relief to the eyes of Peter. Go tell His people… AND Peter. Jesus knows our strengths and our weaknesses. He knows when you have dropped the ball and are beating yourself up about it. He doesn’t like that. He just wants you to come back to Him. Just as He made sure to send this special message to Peter, Jesus has a special message for you too. He has a special message meant to comfort you. 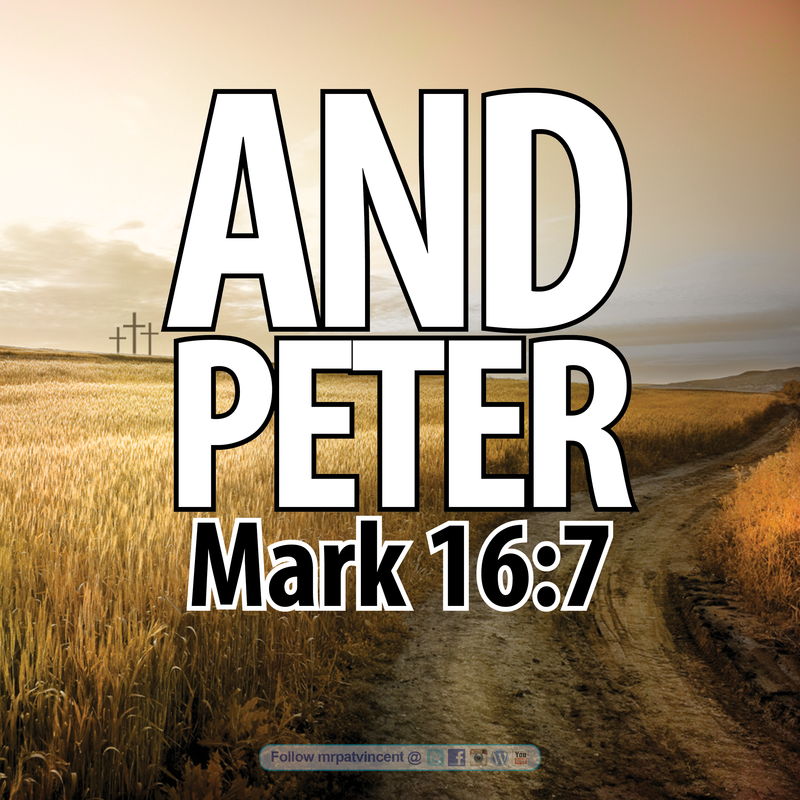 Read Mark 16:7 and replace Peter’s name with your own. This entry was posted in Christian and tagged Bible, Christ, Christian, Christianity, church, Easter, Faith, God, Gospel, Heart of David, Holy Spirit, Jesus, Jesus Christ, Lord, Love, Ministry, Not a Fan, prayer, Preach, Psalms, Religion, Religion & Spirituality, resurrection, Salvation, Scripture, Sunday, Worship. Bookmark the permalink.